A truly wonderful one-off kitchen in a listed Queen Anne house. 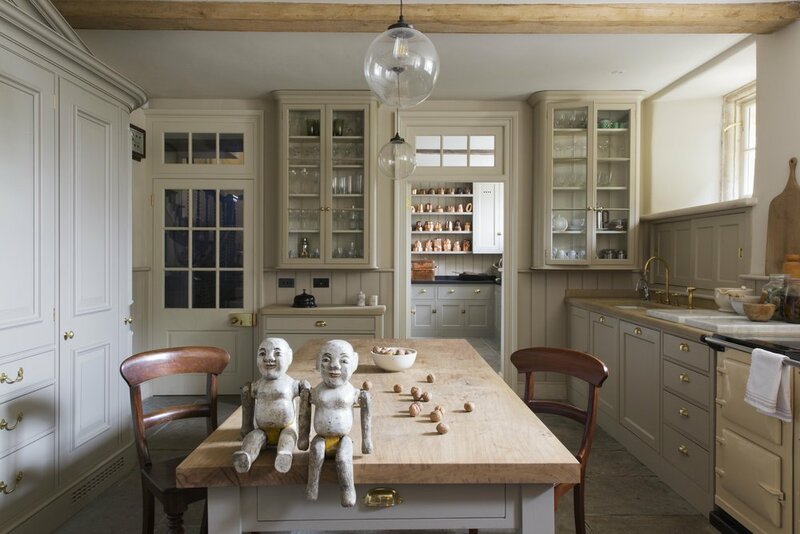 Traditional cabinetry, original stone floors, stone worktop, vintage Aga sit perfectly in this wonderful space. This wonderful one-off kitchen is the perfect choice for this exquisite Queen Anne house. Truly bespoke, beautifully crafted hand made furniture, painted in a muted palette of natural tones, sits perfectly in the space creating a sense of quality and tradition. A large wooden dining table takes centre stage. Antique accessories sit perfectly next to the ceramic sink and brass taps. Elegant tall glazed wall cupboards reach up to the ceiling and frame the doorway. Plain and understated cabinetry bring elegance and simplicity to the utility room. The original fireplace brings charm, character and authenticity to the space.